Jorge Lorenzo would love nothing more than to make it two MotoGP wins in a row in Barcelona. The Spaniard put 18 months of struggles at Ducati behind him to win the Italian GP at Mugello and then promptly announced he would be racing for Honda next season. Lorenzo is priced at 5/1 to repeat his victory at Circuit de Catalunya and a win would go down well with the majority of home fans. But championship leader Marc Marquez rightly starts the Catalunya GP weekend as favourite to win the race and silence any doubters over his title credentials. Marquez, who is 3/2, will be smarting after failing to score points in Italy due to an early crash and if there is something the Spaniard rarely does then that is fail to score points two races in a row. Marquez will also badly want to beat Lorenzo, who will be his team-mate at Repsol Honda next season. There is plenty of home interest in the race as Spaniard Maverick Vinales is priced at 7/1, the same odds as his Movistar Yamaha team-mate Valentino Rossi. Dani Pedrosa, who will leave Repsol Honda next season after 13 years with the team, is well priced at 11/1 for what would be an emotional win if he were to take the chequered flag. Fellow Spaniard Alex Rins’ star is rising at Ecstar Suzuki and, at 50/1, is an outsider but will be keen to continue his progress so far this season. If you fancy a real outsider then Aleix Espargaro is 200/1 but the Spaniard, who races for Italian manufacturer Aprilia, will need a lot of things to go his way if he is to enjoy success on home soil. 1 Jorge Lorenzo (Ducati), 2 Andrea Dovizioso (Ducati), 3 Valentino Rossi (Yamaha), 4 Andrea Iannone (Suzuki), 5 Alex Rins (Suzuki), 6 Cal Crutchlow (Honda), 7 Danilo Petrucci (Ducati), 8 Maverick Vinales (Yamaha), 9 Alvaro Bautista (Ducati), 10 Johann Zarco (Yamaha), 11 Pol Espargaro (KTM), 12 Hafizh Syahrin (Yamaha), 13 Tito Rabat (Ducati), 14 Bradley Smith (KTM), 15 Franco Morbidelli (Honda), 16 Marc Marquez (Honda), 17 Xavier Simeon (Ducati), 18 Takaaki Nakagami (Honda), DNF Aleix Espargaro (Aprilia), Jack Miller (Ducati), Thomas Luthi (Honda), Dani Pedrosa (Honda), Karel Abraham (Ducati), Scott Redding (Aprilia). 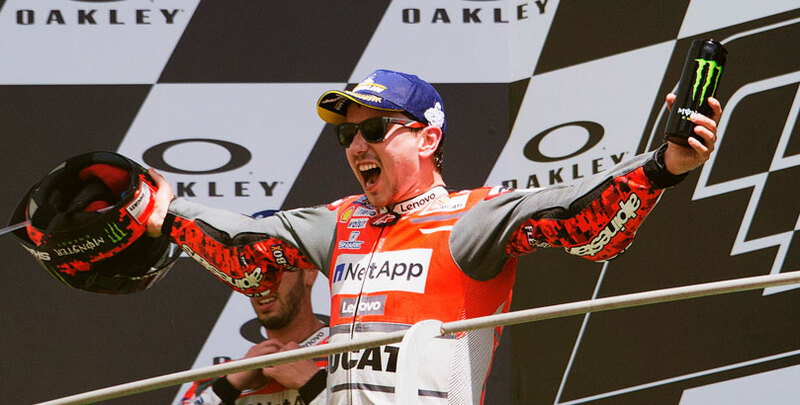 Lorenzo’s stunning victory in Italy was only upstaged by the news that he was leaving Ducati at the end of the year to race for the Repsol Honda team next season. The Spaniard had struggled for a year and a half since leaving Yamaha for a massive pay cheque to race for the Italian manufacturer. But having done something great rival Rossi could not do by winning a MotoGP race on a Ducati he has decided to team up with Marquez next season. Lorenzo’s race win at Mugello followed a familiar pattern as he grabbed an early lead and then set the pace. But unlike other races this season he did not fade out of contention, something the Spaniard put down to a plastic section being added to the top of his fuel tank so he could rest his arms which had got tired in previous outings as his tyres started to lose grip. Dovizioso followed his team-mate home after a steady race from a less than spectacular start, keeping his title challenge alive and making the most of Marquez’s crash. Rossi’s battle to grab a podium, together with a stunning pole position from Saturday’s qualifying session, kept the home fans happy. Fourth was something of a parting gift from Andrea Iannone, who will leave Suzuki at the end of the season. The Italian led home current Suzuki team-mate Rins who will be joined by fellow Spaniard and current Moto3 world champion Joan Mir at the Japanese manufacturer next season. Cal Crutchlow proved that when he keeps both wheels down he can finish well after claiming sixth on the LCR Honda ahead of Danilo Petrucci, who will join Dovizioso at the factory Ducati squad next season in place of Lorenzo. There were no points in Italy for championship leader Marquez who slid off as he tried to match Lorenzo’s early pace and could only finish 16th which saw his points lead cut to 23 points. On a bad day for Repsol Honda, Pedrosa failed to finish the race.